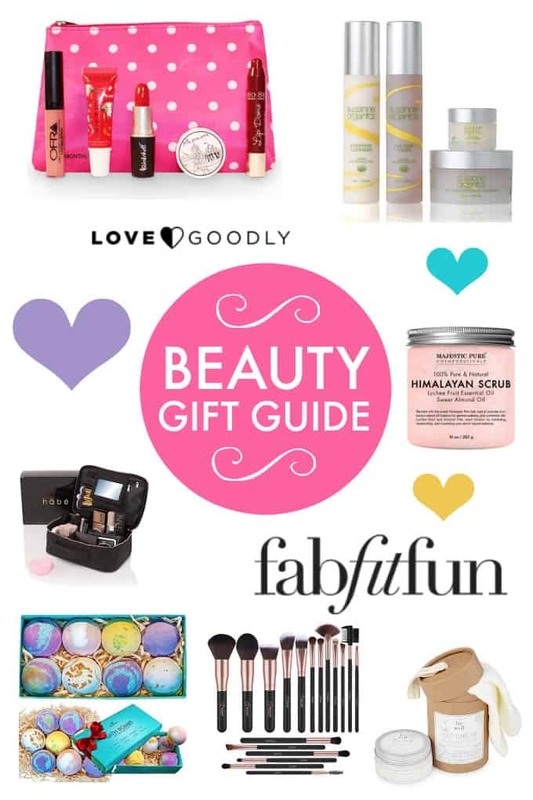 I curated this list of beauty gifts with my oldest daughter, Olivia, in mind. She just turned 20 years old and loves all things beauty and pampering. I figured I wasn’t alone and others would be looking for a beauty gift guide to help them decide on what to purchase for a holiday or special occasion. You’ll find a mix of beauty subscription boxes (because I’m obsessed with them! ), skincare, makeup, bath products and more. I hope this gift guide makes shopping a little easier for you! 1. FabFitFun. I love this quarterly subscription box! Get $200 worth of beauty, fitness, wellness products for only $49.99! Use the code FIRSTBOX to save $10 on your first box. 2. SUZANNE Organics 4‑Piece Skincare Kit. Get beautiful skin with these organic skincare products from Suzanne Somers. I have this set and love it. 3. Overnight Foot Care Kit. Take care of your feet while you sleep! This kit comes with cream and socks to wear. 4. Benevolent Beauty Box. Receive 4 to 7 cruelty-free beauty products every month with this amazing subscription box. 5. Vegan Cuts Beauty Box. Get skincare and beauty products delivered with this fantastic subscription box. 6. Lip Monthly. Get 4 to 5 lip products delivered every month in a collectible bag. 7. Love Goodly. Receive eco-friendly beauty products right to your door monthly. 8. Bath Bombs Gift Set. Relax and soak away the stress with this fabulous gift set. 9. Majestic Pure Himalayan Salt Body Scrub. Improve your skin with this pure and natural scrub. 10. 18-Piece Makeup Brush Set. Perfect for all makeup lovers to apply their best face. 11. Travel Makeup Bag. Keep all your makeup organized and easy to find with this travel bag. 12. Spring Spa Gift Set. Contains soaps, lip balms and room spray. The perfect relaxation box! For more gift guides, check out this Disney gift guide, Harry Potter Gift Guide, gifts for tea lovers, gifts for coffee lovers and gifts for book lovers. Which beauty gift is your favourite?